The River Ebro, located in Spain, is one the largest and best-known rivers in Europe. It’s world-famous for monster wels catfish, top class river carp fishing and many other species which thrive in its rich waters, including a host of predators such as bass, zander and perch plus sea species. The river starts in the North of Spain near Santander in the Cantabrian Mountains, and flows approximately 500 miles along the southern foothills of the Pyrenees in Northern Spain before emerging onto a large delta 100 miles south of Barcelona, into the Mediterranean Sea. 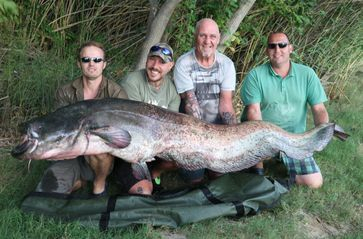 The wels catfish are present throughout the Ebro and the Lower river offers many opportunities to catch these hard-fighting predators on a variety of methods with 100lb-plus fish caught regularly. Our 2km of private banks and swims and well-equipped boats offer the perfect way to fish for the carp and wels – which grow to over 200lb in this area – surrounded by the lush and beautiful Catalonia countryside. More locally, we are situated between the Beceite mountain range and the Ebro Delta near the town of Tortosa. The Spanish River Ebro and the surrounding area is the ideal destination if you're looking for a true Ebro Sporting Adventure! This is a view from one of our private, well-shaded swims. I have been fishing the River Ebro since the year 2001 myself and I know every nock and cranny of the Lower Ebro river. There are over 15 different species of fish I've actually caught but I know there are more from other anglers’ and photos. These include: common and mirror carp, crucian carp, several types of barbel, roach, rudd, dace, black bass, chub, sea bass, American largemouth bass, gudgeon, pumpkinseed, eel, wels catfish, channel catfish, zander, perch, sea bream, bluefish, jack cravalle & more.